Ten minutes into a little antiquing trip upstate this weekend, I was ready to break for lunch. BORING. I would rather fly down a toboggan run without a toboggan - but still plan to become a booming antiques merchant myself before hitting 50. The easiest dough I’ll ever pull in. One item I might eventually put up for sale is an oil painting I found 11 blocks away from me and carted home 2 weeks ago. As soon as it came into my line of vision, I realized it was made for the wall above my kitchen table. After the hanging, I learned that you’re not supposed to place oil paintings in kitchens or bathrooms because of the smoke and steam – and that I should move it. But I had reservations about transferring a portrait of wine bottles to the available space above my bed, so I let it hang tight. While re-admiring the painting the other morning, I noticed the damage – a splotch (after 2 weeks in a ventilated area which isn’t that close to the stove) on one bottle’s label. 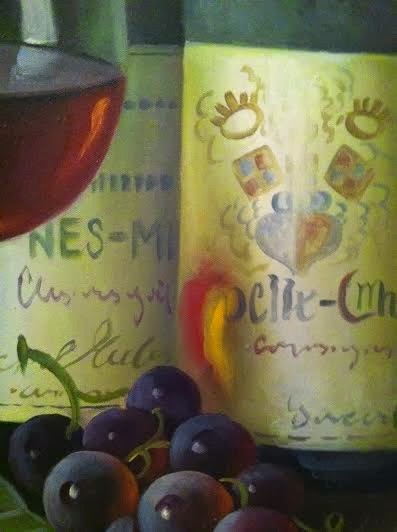 If you tweak your perspective, the splotch actually looks like a red-wine-spill stain the painter deliberately integrated into the scene, with the moral of the mark being that the more red wine bottles you line up, the greater the odds of things getting messy. When I surveyed the entire painting yet again, it seemed like 2 additional, lighter-color splotches were in the process of forming elsewhere. Now, I’ve zoomed in on a photo of the painting I texted to someone immediately after hanging it – and see that all the splotches have been there all along. I inspected the canvas before buying and after hanging, reveling in how pristine it appeared. And it never was. A phenomenon I’ve experienced many times before, with people, experiences, relationships, etc. 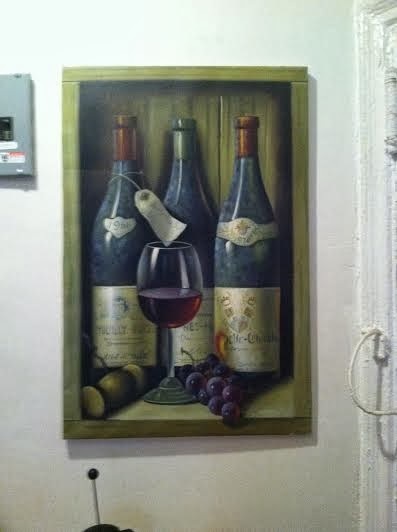 This posting was definitely a philosophical look at life through wine stains in a painting. I loved the last paragraph, especially. ". . . how pristine it appeared. And it never was. A phenomenon I've experienced many times before, with people, experiences, relationships, etc. . . " So expressive and well written that it gave me the chills. After looking more closely at your photographs, I think the large splotch is the artist's capture of light rays refracting (bending) through the wine onto the nearby surface of the bottle. Great analogy...also, that something can be beautiful precisely because it's flawed is the essence of life, I think... finding the beauty in the imperfections... because really, nothing is ever "perfect". I love antiques... I always wish they had voices so that they could tell us stories of their previous owners and previous eras.